An open tote, with short handles, a long strap and a clever little pouch that can be attached to the outside or inside of the bag - or carried separately as a clutch. I think Coca delivered on his promise to design beautiful but practical bags: The size is just right for nipping to the shops or popping in your office stuff (though I'd be careful carrying it on public transport, as there's no closure) and the strap makes it really versatile. The leather feels lush but sturdy and like it would wear well. Prices start at £795 for Black Flat Calf but (as per usual) my favourite is slightly more. 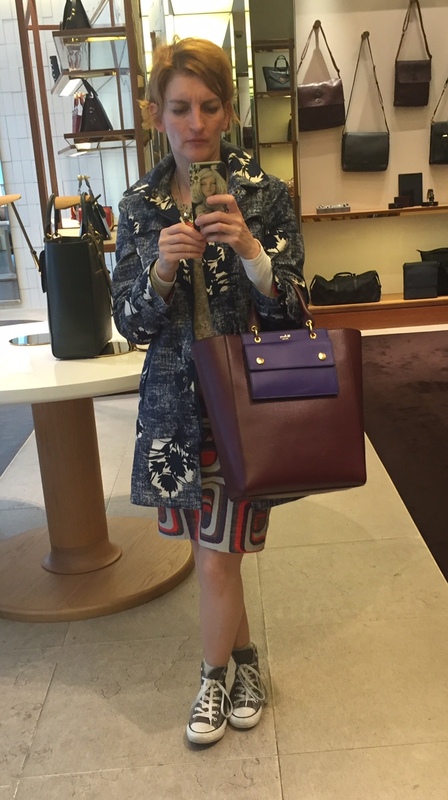 I really like the colour combo in the Burgundy Printed Goat with its purple pouch and (£895) but - being my predictable self - my favourite is the Black Polished Embossed Croc (£995). What do you think? Have you had a play or maybe even bought one?